Epic morning shelf cloud. Supercells likely today as peak season shifts into high gear. Today started out with a severe thunderstorm that moved into the Capital region around 6am, a rare storm only striking in the early morning at best one per year. More storms are firing up and moving east through the afternoon. AlbertaWX chasers Ryan Keller and Mike Rurak will be on these storms in the Red Deer area. July 20 2013 chase report. 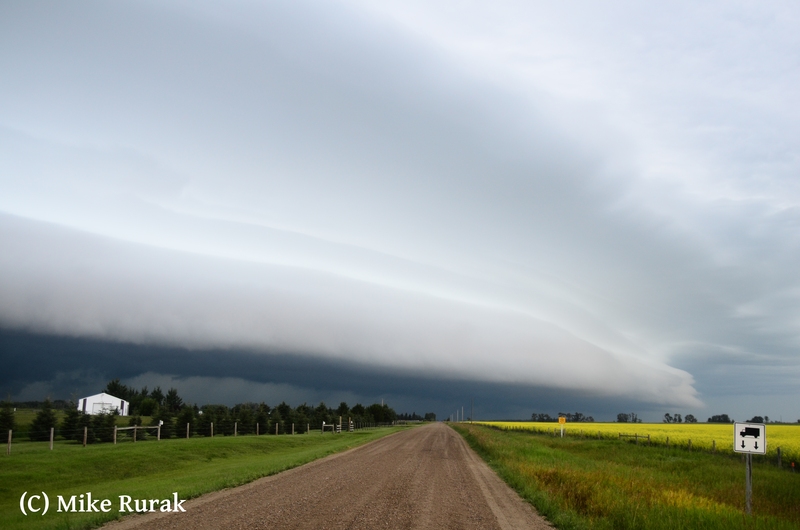 AlbertaWX was out for day 2 of a severe weather outbreak. More supercells with a bigger punch formed up over the northern foothills and made an erratic path southeastward. The first one started near Drayton Valley with more behind it. 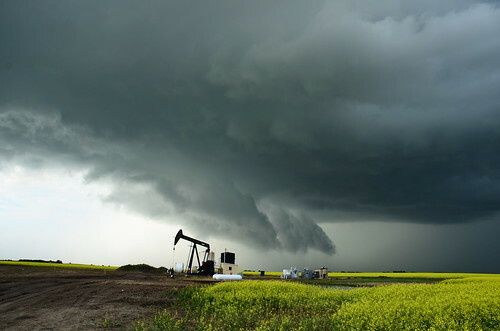 The easternmost cell turned 90 degrees south from Breton to Rimbey only to turn east again towards areas north of Lacombe, I topped up on gas in Lacombe when the storm took another 90 degrees turn south, pummeling Lacombe and then Red Deer. It was easier to enjoy the 2nd storm as it did not carry the huge hail or the erratic path though the now nocturnal show was just a continuous flashing and no real CGs to speak of. Overall more great structure, and incredible footage of a hail core at night. A tree snapped by the winds, hail splashing down on puddles, and cars getting dented just some of the action in yesterdays chase video. It would have been nice if the storms fired up earlier instead at dusk as chasing after these cells was not the best idea in the darkness of night. Some good CGs would have been nice as well. More severe setups are in the offing, Monday(July 22nd), and Wednesday(July 24th) just the first two. The weekend looks ripe once again with supercells, Dewpoints could rise into the 20Cs as well. Here is some footage from our July 14th 2013 chase. sorry for the late upload! The cape was high but with the helicity very low so I was not expecting much more than pulses today. Instead a surprise in the form of a dozen supercells forming over central and Southern Alberta proved again that the computer models are useless. The storm rapidly intensified in the warm and humid air that was much warmer than was forecast. The storm passed over Wetaskiwin denting cars all along the auto mile with quarter to loonie sized hail. This ended a 37 day period of minimal thunderstorm activity for the city. Me and Matt then followed an intense supercell near Camrose even while the first storm was still trucking along. At the peak we had 4 supercells in a 50km radius of our position. Each was discrete and the day was almost perfect. Though Matt was hoping for some lightning shots the supercells offered some of the best structure of 2013. The helicity and shear is significantly higher for tomorrow, so if the same dynamics as today are in place we can expect potentially viscous supercells with hail in excess of baseball size in some of these storms. Wind gusts of over 100km/h and microbursts with a concern and the risk is there for tornadoes if lower level shear is stronger. Ryan Keller and Mike Rurak intercepted a severe warned cell south of Gull Lake pics and video to come. A rotating wallcloud was observed. Models starting to show some consistency for Severe thunderstorms over the next 3 days. Today the storms are isolated to to areas south of the Trans Canada highway. Though good CAPE and helicity exist in the Edmonton area, there is no flow aloft and the storms that do form will be stationary and short lived. Tomorrow looks to be good in the Red Deer area up towards pigeon lake and Drayon Valley, some last long enough to reach the QE2, they look to cycle south through the evening and likely miss Edmonton to the south..
Wednesday looks to be the best, another mean cold front will slice down in the evining not before temperatures reach the high 20s and dews will rise to 20C. not as humid as last week but the shear is significantly better. I put a slight risk of tornadoes in the Pigeon lake, Stony plain, Morinville areas, the risk is slightly lower to the east and south including Edmonton, areas north of Red Deer, and the Camrose, Wetaskiwin area.